Rows 2 to 6 - 1ch, 1dc into base of 1ch, 1dc into each dc to end, ss to first dc. Turn. Row 8 - (1dc, 2ch, 1dc) into each 2ch space to end, ss to first dc on beginning of row. Turn. Rpt Row 8 until 23 rows have been worked or work measures approx 7 Inches from beginning. Fasten off. Handles x 2 - Make 51ch, 1dc into 2nd ch from hook, 1dc into ch to end. Fasten off. Attach flower motif to front of bag. 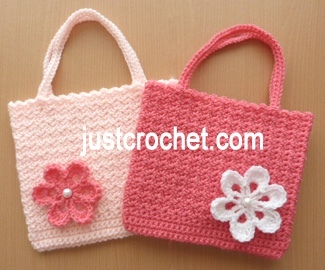 Hope you enjoy this free crochet pattern for a sweet little girls purse.